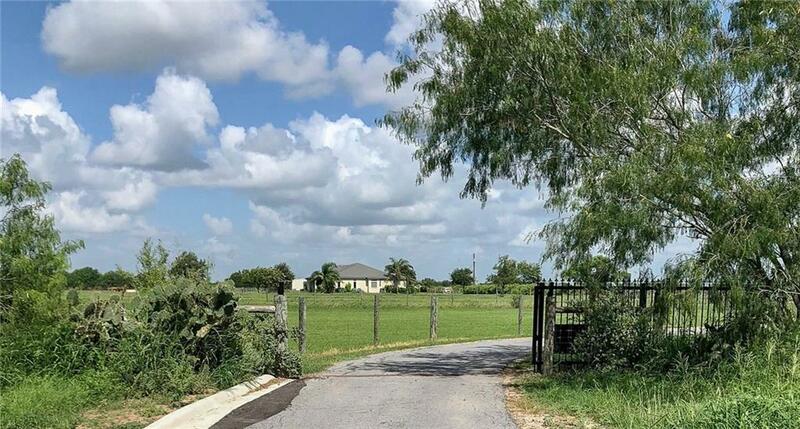 Custom-built 3,043 sq ft Ranch-style home on 13-plus acres located in a quiet, gated community south of Weslaco, Texas. Built in 2004, the beautifully landscaped 3 bed / 3 bath home offers spectacular views of pastures bounded on the south by 40 year-old trees and a Texas wildlife management area.The house features 10-foot ceilings, tons of natural light, two living areas, a study off the living room, walk-in closets in each bedroom and ample storage throughout. Bright eat-in kitchen boasts lots of countertop space and center island. Master has crown molding, plantation shutters, two walk-in closets, double vanity, jetted tub and separate shower. *Large Utility Room with sink *2 HVAC units < 5 years old zoned with programmable thermostats and 2 water heaters*Home has water-well, septic tanks and complete water treatment system with water softener and sand filter. *Property has s 75 x 30 pole barn with four portable panel stalls, feed and tack room.